Quick overview For Gideon Mack, faithless minister, unfaithful husband and troubled soul, the existence of God, let alone the Devil, is no more credible than that of ghosts or fairies. Until the day he falls into a gorge and is rescued by someone who might just be Satan himself. 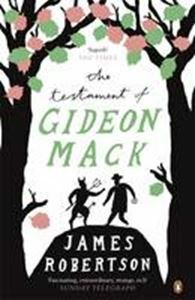 The Testament of Gideon Mack is James Robertson's acclaimed novel exploring faith and belief. For Gideon Mack, faithless minister, unfaithful husband and troubled soul, the existence of God, let alone the Devil, is no more credible than that of ghosts or fairies. Until the day he falls into a gorge and is rescued by someone who might just be Satan himself. Mack's testament - a compelling blend of memoir, legend, history, and, quite probably, madness - recounts one man's emotional crisis, disappearance, resurrection and death. It also transports you into an utterly mesmerizing exploration of the very nature of belief. "Fascinating, extraordinary, strange, rich". (Sunday Telegraph). "Overwhelmingly compassionate and thought-provoking. Demands another read". (Irvine Welsh, Guardian). "Hugely enjoyable, very funny, deeply refreshing ...its touch of devilry makes it even more of a joy". (Herald). "Fabulous ...a work of the highest literary quality". (Scotland on Sunday). "Astonishingly accomplished, utterly compelling from start to finish ...could well be the best novel published anywhere this year". (Big Issue). "James Robertson is a brilliant novelist. It's a long time since I read a novel in which the contemporary notions of faith and belief were so frankly tested". (Ali Smith). James Robertson is the author of the novels The Fanatic, Joseph Knight, The Testament of Gideon Mack, And the Land Lay Still and The Professor of Truth. The Testament of Gideon Mack was longlisted for the 2006 Man Booker Prize, picked by Richard and Judy's Book Club, and shortlisted for the Saltire Book of the Year award, and And the Land Lay Still was the winner of the Saltire Book of the Year Award 2010.